Implant retained crowns can restore one or all missing teeth and is the treatment option closest to having your own natural teeth both functionally and aesthetically. 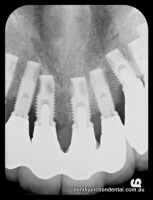 Implants are self supporting and treatment does not involve other teeth as occurs with bridgework. 2.) Dental implants can be used to stabilise and hold dentures. Two to three implants can be used to stabilise a denture. It may not be possible for physical or financial reasons to replace all missing teeth in an arch. Placing two implants to engage an existing or new denture is a relatively easy and cost effective treatment option. There is a world of difference if a denture is retained by implants. Patients do not have to worry about teeth moving during function, have greater biting force and have less sore spots as their dentures do not move about while chewing. A.) Hybrid implant retained dentures:- A metal framework holding denture teeth is bolted onto four or more implants. Although a dentist can remove the appliance if required, patients will not be able to remove this restoration as hybride dentures are bolted into the implants. B.) Stud retained implant denture:- A denture can be stabilised using only two or three implants with clips or press stud type attachments that clip into the denture base. This denture is removed by the patient for daily cleaning.